In this computer age, the world is confined to touch screens and eye strains are quite common. It's not just because of working on computers for long hours, but can also be due to watching TV, going for long drives especially during night time and working or reading in poor lighting environment. Recurrences of eye strains are quite common but certain modifications in the nature of job and other factors related to eyestrain can prevent eye strain to a greater extent. •Take Micro-Breaks: It is one of the best and most simple ways to prevent eye strain. All you need to do is to shift your focus for 20 seconds to some other object. •Modify Your Work Area: Certain modifications like using non-reflecting interfaces whenever possible, adjusting your screen such that it is at a 90 degree angle from any direct light source, using more of indirect lighting and anti-glare filters on monitors can help you to minimize the possibilities of straining your eyes. •Do Eye Exercises: Exercise your eye muscles to allow it to get strengthened and to develop good endurance. Some effective eye exercises include blinking eyes against resistance at eyebrows, watching up and down and diagonally and opening eyes against resistance. •Massage Your Eyelids: Massage your eyelids and the surrounding muscles gently in between long hours of strenuous work. This process induces relaxation and improves circulation. It also stimulates the tear glands which prevent dryness of eyes thereby reducing the symptoms of eye strain. •Use Protective Eyewear: The use of protective eyewear designed optimally for computer use or for driving may help prevent eye strain. 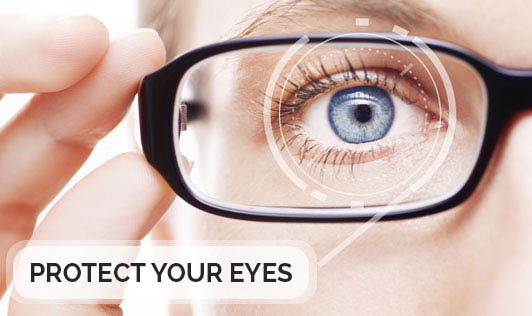 Eye strain can lead to a number of problems like tension headaches and neck aches. In many cases, you may have to consult an ophthalmologist. We just have a pair of these jewels, protect them!